← The Secret to Beautiful Liturgy: Leave it to the Kids! The Fourth century saint and doctor of the church, St. Hilary of Poitiers, has a lovely insight – or perhaps I should say – a somewhat different take on Our Lord’s prayer in the garden. Saint Hilary “the Hammer of the Arians” does not interpret the passage in the usual way. Granted that Sacred Scripture is manifold in its meaning as St. Augustine points out in his De Doctrina Christiana. The usual way to interpret the passage (which is recorded in Matthew, Mark, and Luke but not in John!) is that this prayer demonstrates that Christ was not only true God but he was also true man. True, there are many passages in Scripture where we encounter incontrovertible evidence that Christ was true man. I am thinking particularly of all the passages that show us that our Lord ate food. Nothing reminds me that I am a genuine corporeal being so much as the times I find myself eating. Our Lord’s prayer at Gethsemane might also serve the same purpose. The body has a natural repugnance, even a fear, for death, and so Our Lord was demonstrating his humanity when he prayed in the garden. His body had such a repugnance for death and suffering that he even sweat blood! Pure spirits do not flinch at the prospect of a painful crucifixion. But in order to prepare you for St. Hilary’s interpretation just consider with me for a moment. Here is a man who was born with a mission. Christ is the very Word of the Father incarnate among men. And when he came down among us 2000 years ago he did so for a very special reason – a reason that He spent His life teaching us. Didn’t Our Lord know about His mission? Didn’t he realize what His Father’s plan was? Isn’t His will one with the Father’s? Christ is a man who beyond anyone else in history knew what he was doing. Christ was a man who more than anybody was prepared and trained for the battle that he was to fight. Why then would Jesus say “Father Let this Chalice pass” at the official “kick off” of the Passion in the Garden at Gethsemane? Of course in His case those seemingly impossible odds were seemingly impossible to everyone except Him. In other words Christ did not begin His passion by praying to His Father to make it all go away. My Father, if it be possible, let this chalice pass from me. Nevertheless not as I will, but as thou wilt. Well, I would never have discovered St. Hilary’s interpretation if it were not for St. Thomas Aquinas and his marvelous work -that most exquisite source of instruction-that immeasurably edifying tome of wisdom… the Catena Aurea! And here it is that among the wise and holy scripture exegetes that St Thomas “chains” together-is none other than the the cheerful Hillary of Poitiers! …He says not, Let this cup pass away from Me, for that would be the speech of one who feared it; but He prays that it may pass not so as that He should be passed over, but that when it has passed from Him, it may go to another. To pass from is not the same thing as to pass by. Interesting how a little knowledge of prepositions can help! No wonder Grammar is a Liberal Art! In other words, one cannot pray that a chalice pass from oneself without first intending to receive that chalice. His whole fear then is for those who were to suffer, and therefore He prays for those who were to suffer after Him, saying, Let this cup pass from me, i.e. as it is drunk by Me, so let it be drunk by these, without mistrust, without sense of pain, without fear of death. Let this chalice pass from me to those who love me. Let this chalice pass from me to all Christians and let them drink it as I drink it. That is, let them drink this chalice without fear. Let them drink it with faith and without any mistrust. That He says, Not as I will, but as you will, He would fain indeed that they should not suffer, lest their faith should fail in their sufferings, if indeed we might attain to the glory of our joint inheritance with Him without the hardship of sharing in His Passion. He says, Not as I will, but as you will, because it is the Father’s will that strength to drink of the cup should pass from Him to them, that the Devil might be vanquished not so much by Christ as by His disciples also. Rather than voicing a prayer expressing fear, Our Lord prays that we, his disciples-indeed all Christians, will embrace the cross as he did. Out of love for us he prays with an infallibly effective prayer to the Father that we his friends will not fail to follow his path. He prays that we will drink the chalice from which he drinks. That it will pass from Him to us. He prays that we will not fail to take up the cross and join with him in the salvation of our souls. This entry was posted in Catena Aurea, Easter, Uncategorized and tagged Catena Aurea, Hillary of Poitiers, Holy Week, Matthew 36:29. Bookmark the permalink. Perhaps Our Lord was not trying to demonstrate his humanity. But what if He merely wished to set an example for us in our hour of temptation? Aquinas says Christ wanted to be tempted in order to 1) conquer our temptations 2) to remind us that no one is so holy as to be above temptation 3) to teach us how to overcome temptation and 4) to give us confidence in His mercy by knowing our Judge also experienced temptation. If Our Lord was not being tempted in the garden, then none of this applies, and the passage seems to have less significance for us sinners. And if you want to say that Aquinas’ exegesis only applies to the temptation in the desert, then it seems unfitting that Our Lord would choose to suffer temptation at a time separate from His Hour. Resisting temptation when you’re hungry is significantly easier than resisting temptation when you’re about to be scourged and crucified, wouldn’t you agree? Well, I like your four reasons for explaining why Christ allowed himself to be to “tempted” (Thank you!) – at least as regards the temptation in the desert. But as you suggest, I am not accustomed to think that his prayer in the garden of Gethsemane was a temptation. I am interested in why you think it is. 1) As I said, it seems unfitting that Christ would suffer temptation when He was hungry but not when His Hour had come, particularly when the whole point of His suffering temptation is to set an example to us (does that make sense?). 2) St. Padre Pio and Venerable Archbishop Fulton J. Sheen (among others) say Christ’s human nature was in conflict with His Divine Nature, not due to any sinful desires of Christ, but due to His Body’s natural aversion to death and bodily suffering. Padre Pio says Our Lord’s nature “rebelled against such a sacrifice” and that there was a “bitter combat” between His will and His bodily desires. Fulton Sheen says Our Lord naturally shrank from the Passion but that this was ultimately overcome by a Divine submission to the Father. For the record, I am more inclined to accept Hilary’s exegesis but I am curious how you would respond to these points. Thanks again Joseph. Would you mind forwarding me the texts from which you are reading in an email? Thank you for this post, Mark, and for your comments, Mr. Gonzalez. Regarding the desert – garden connection, it seems fair to read these two events as “bookends” to Jesus’ mission, whereas He freely accepts His mission at its initiation and its conclusion. Regarding St. Hillary’s reading of “let this chalice pass from me,” I would be cautious about presenting it as definitive. As interesting and enlightening as it may, we should note that St. Hillary’s view in the Catena Aurea is only one of several. Both Origen and St. Augustine directly contradict him, while none of the other Fathers support him. Mr. Gonzalez has already pointed out St. Pio and Venerable Archbishop Sheen. In addition, our Catechism supports the interpretation of these four, not that of St. Hillary (cf. CCC # 612). An Italian mystic in the process of being beatified by the Vatican was given knowledge by Jesus Himself how to live in the Divine Will which was recorded in her 36 volumes Book Of Heaven. And Jesus explained thus in part; ………. ‘If it be possible, let this chalice pass from Me’. Do you think it was I? Ah, no! – you deceive yourself. I loved suffering to folly; I loved death to give life to my children. It was the cry of the whole human family that echoed in my Humanity; and I, crying out together with them to give them strength, repeated as many as three times: ‘If it be possible, let this chalice pass from Me’. I was speaking in the name of all, as if it were my own thing;…..
……………………. “My daughter, do you think it was because of the chalice of my Passion that I said to the Father: ‘Father, if it be possible, let this chalice pass from Me’? Not at all; it was the chalice of the human will which contained such bitterness and fullness of vices, that my human will, united to the Divine, felt such repugnance, terror and fright, as to cry out: ‘Father, if it be possible, let this chalice pass from Me.’ How ugly is the human will without the Divine Will which, almost as within a chalice, enclosed Itself in each creature. There is no evil in the generations, of which it is not the origin, the seed, the fount. If St. Hillary’s interpretation is correct, what would be the cause of Our Lord’s bloody sweat? Far be it from me to diss St. Thomas Aquinas, but I think he’s “stretching” on that explanation. Our Lord sweat drops of blood, and the most plausible reason is anxiety. Occam’s Razor should be applied here. I believe a separate issue is Our Lord’s and God’s sorrow that all mankind will not benefit from this sacrifice, but my sense is that St. Hilary and St. Thomas were possibly being over-zealous in defending Jesus’ divinity at the expense of admitting his weakened humanity. Mark, thanks for this interesting post. Always good to hear from a minority voice among the fathers of the Church; these minority voices often open up a more richly-developed understanding of a given passage. 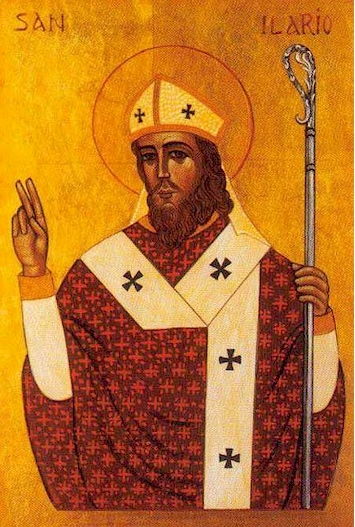 In this case, with all respect to St. Hilary, the abundantly clear sense of the passage is that the Lord is experiencing a human, non-sinful fear of his passion, which he knows will include not only bodily suffering, but also the entire weight of the sin of the world, which no one who was not divine could possibly bear. Simon of Cyrene helps him a bit with the cross, but no one can help him to bear that other, incomparably heavier weight. The evangelists go out of their way to indicate that he is troubled and distressed, not just anxiously awaiting the fulfillment of his mission. For example, St. Matthew’s account uses the word perilypos, meaning ‘exceedingly sorrowful’ to describe Jesus’ interior disposition as he heads to pray in the Garden (in fact, it is Jesus himself who gives this description, not Matthew as the narrator). St. Luke, in 22:44, uses the word agonia (agony) to talk about Jesus’ emotional/psychological state while he is praying. With regard to the cup itself, St. Mark uses the verb paraphero, meaning ‘remove’ or ‘take away’, with no sense of drinking it first. It is very important for us to know that Jesus was afraid to die (which is why several evangelists emphasize it), because if he went to his death with nothing but an earnest desire to fulfill his mission, then he is effectively committing suicide (i.e., seeking his own death), rather than submitting himself to the Father’s plan. This submitting has no hint of contradiction between him and the Father, as if he resents the plan or has anger about it; but it is natural and right that he should want to live, because life is an intrinsic good. Thank you. I am so tired of hearing people interpret that passage on their own, aside from Sacred Tradition, and foolishly and erroneously assert that Our Lord, the Incarnate God, was afraid of physical pain. Thank you Jordan for your thoughtful comments. While I agree that the passage does manifest the human nature of Our Lord, that he had passions like the rest of us, I am not comfortable with the assertion that Our Lord was afraid or scared to die. I am uncomfortable saying that there was any movement whatsoever in our Lord that was contrary to reason or, even more, contrary to the will of the Father. Our Lord did not suffer from any disorderly passions- but everything in Him was in perfect harmony with his reason. Although He says “Not my will but thine,” we should not understand these words as indicating any opposition in his will – or any war within himself- but merely as an example to us about how we should pray in the face of severe adversity. I am thinking of Socrates who willingly and fearlessly embraced his execution (no suicide) and remonstrated with his friends concerning how irrational it is to be afraid of death. And we read about Christian martyrs- some literally ran into the Colosseum so zealous were they to die for Christ. While agreeing that Christ suffered in his body to the point of sweating blood, I am not comfortable with saying that there was any opposition in his will or desire at any time to the will of His Father…or for that matter there was no opposition at any time within Christ Himself in His two natures. The context remains where he is disappointed or discouraged that his disciples could not stay awake to pray. Christ was not a human being. Well, thank goodness for arm-chair Theologians. Keep it up! I am grateful. Thanks for the clear and concise response Mark. It helped me condense the issue down (hopefully not oversimplifying) to whether Jesus is praying for God the Father to take back “this chalice” (I extrapolate to “mission”) or to “transfer this chalice” to His apostles/disciples. The use of English words like “return” and “take” don’t seem to help with the latter interpretation. The means by which Jesus proved his humanity, time and time again, was by eating and drinking. His suffering in the garden in no way showed fear, anxiety, cowardice, or any such thing. I believe what was going on here, with the sweating blood and His pleading for the cup to pass, was Jesus’ Sacred Heart breaking for all the souls who would not be saved. In other words, Jesus was about to take on the Cross to redeem the whole world, but a multitude would choose to reject this free gift. It was in the Garden that Jesus felt this awful pain; he personally loves every soul, even those who choose Hell. So imagine His heart breaking for the fact that even He could not save a multitude of souls. He asks the Father if there is a way for this cup to pass, meaning, can’t I save everyone? According to the Second Letter of St. Paul to the Corinthians, although Jesus was without sin, He was “made sin” for us. Meaning, He acted on our behalf at various points in His Passion, for the sake of Divine Justice. It was not just His human nature crying out, but me, whose guilt He has taken upon Himself. Dr. Barbet in his book “A Doctor at Calvary” expressed the opinion that fear makes blood drain away from the skin and one goes pale, whereas blood rushing to the skin to break out into a bloody sweat was an indication of extreme force of will, straining so to speak. He’d cited rare examples of this, but I’m relying on memory as I no longer have the book. Also, Our Lord said: “With desire, have I desired to eat this Pasch with you” so He, of course, had full knowledge of what lay ahead. Personally, I think it was foul, ugliness of the enormity of evil from Adam till the Parousia piled on Him that recoiled at the filth of sin, rather than the mere thought of death itself. If He hadn’t cried out, and as it did happen, heresies denying his Humanity would have had more traction. I may have stumbled across a clue today while praying the Novena to Divine Mercy. Thank you, Mark for sharing. This helps a lot. Thank you Marietta and Michael too. Also, didn’t Jesus rebuke Peter for defending him? + JMJ Mr. Langley, can you write one on “My God, My God, why have you forsaken me? Reblogged this on Classical Catholic Education. This would seem to indicate a true agony, not simply an example of agony, or an agony on behalf of others. To one who is pure, sin is repugnant. To the one who is God made man, taking on all the sins of the world would be unspeakably vile. Why would an angel come to strengthen him? I don’t know how to reconcile St. Hillary and the other Fathers on this. How do you/St. Thomas do this? Well, I don’t think St Hillary is denying that Jesus experienced a true agony. But it appears as if he is denying that Jesus prayed to the Father a prayer which indicated some kind of unwillingness or fear about taking on this agony. The angel comes to him, undoubtedly at the command of the Father, in order to strengthen our Lord physically. Our Lord would not stregthening with regard to his internal resolve.